Honda's 200HP engine is a 3.5 Liter, 60 degree V6, packaged in a beautifully compact design. It offers all the power you'll ever need with less fuel, thanks to Honda's lean burn technology. The 200HP is based on the same engine that powers Honda's Odyssey and Pilot automobiles. So you know you can expect long-term durability and clean, quiet operation. Many of the best boats come equipped with Hondas. Too many to show here, but to see a complete list click best boats. Honda is also the choice of many fishing Pros like Charlie Ingram whose achievements include 8 BASS Classic qualifications and 4 BASS wins. 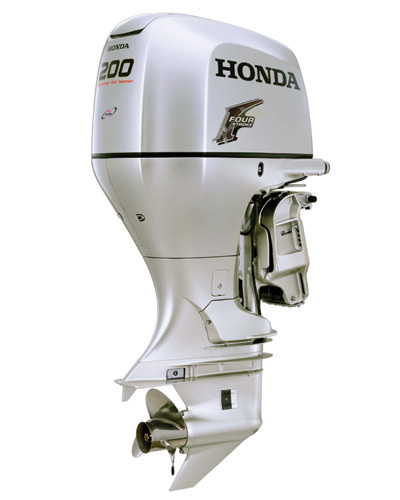 If you're looking for come back dependability and fuel efficiency, Honda's 200HP is your engine.